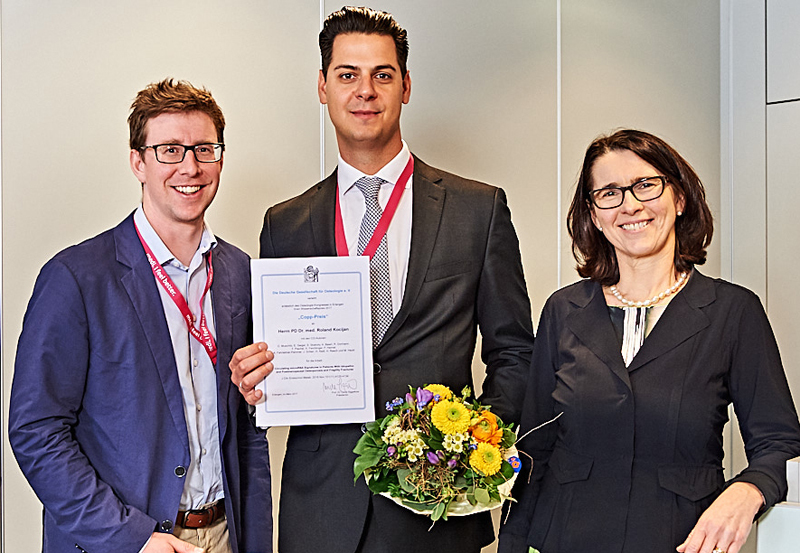 Roland Kojican received the COPP award from the German Association of Osteology (Deutsche Gesellschaft für Osteologie, DGO) for his work on the correlation of microRNAs to bone microstructure and histomorphometry in patients with idiopathic and postmenopausal osteoporosis. The DGO stated that they acknowledge the novelty of these findings and want to promote further studies on miRNAs and the translation of the findings into clinics. miRNAs recently shifted into focus of a variety of medical research fields. Several members of the cluster were involved in the project: the Ludwig Boltzmann Institute for Experimental and Clinical Traumatology, the Bernhard-Gottlieb University Clinic of Dentistry, the University of Natural Resources and Life Sciences Vienna and the TAmiRNA Gmbh. Roland’s presentation had also been announced a highlight of the OSTEOLOGY 2017 congress which took place in March in Erlangen.